Don't Drag out the Process of learning to read. ​It's too important and easily achieved. Finally. The English language is organized. ​Say Hello to Reading in 9 Charts​. Begin with alphabet letters and end in chapter books. Most of the frustration for people learning to read comes from never knowing when it's going to end. Hanson Reading is the beginning and end of learning HOW TO READ. This program allows for all types of learners at any age to gain the most important aspects of reading knowledge to be successful. ​Where does this system begin? Starting at the beginning is important in learning to read. We must first recognize the NAMES of the letters (Chart 1). (Chart 2). Reading begins with LONG VOWEL words using a fun and simple song to decode the vowel sounds (Chart 3). The process of skill learning from the Charts and then practice reading from the Hanson Reading Book library continues through Chart 9. ​Click here to learn more about the Hanson Reading Phonics Chart System. ​need to know to READ and WHEN so you can succeed. How Does Hanson Reading Make a Difference? "I have four children. Each is different in how the learn-but they are all perfectionists. Our fourth is even more of a perfectionist and can’t take correction well, so my ears were open when I heard the rave reviews from friends whose children had taken Hanson Reading classes. I was ready to accept any help and less contention for our busy household. I didn’t realize that learning to read could be so easy and pleasant. Not only is there a simple way for my son to figure our words using the CODE, that even I can understand. He loves to show off to me AND I don’t have to dash his enthusiasm by telling him that this word and that word doesn’t work. He is excited about reading and WANTS to read." "We received some great news yesterday. . . Christopher scored "higher than 99% of sophomores" on the Critical Reading portion of the PSAT. Not bad for someone who read at the "0" percentile when he was 6 years old. You should stand up and take a bow because if it hadn't been for you, this never could have happened. When you took on the project of turning a dyslexic into a reader, you changed Christopher's life. He went from being a child who begged me every day to let him stay home from school to a child who loved school and read voraciously. I still remember walking through the airport and having to caution him that if he didn't look up from his book he was going to crash into someone/something. Christopher (and his parents) will be forever grateful to you." Andrew spent this past year in a highly rated public kindergarten, struggling with learning to read. He hated reading and fought whenever we tried to practice at home. Since attending Hanson Reading, we have noticed immediate improvement in his ability to read after just a few sessions, but more importantly, we have seen a dramatic improvement in his attitude towards reading and a big boost in his self-confidence. ​This program offers reading, comprehension, phonics, spelling, writing and practice application- no other reading program offers the whole package that HANSON READING delivers. ​ Hanson Reading Charts serve as a quick evaluation tool showing exactly what a child knows and if there are gaps. Hanson Reading has taught thousands of children to read well. Quick learners read with more accuracy and those that need more practice do not fail with Hanson Reading. ​Learners gain confidence in their skills, enjoy the fun characters and find accomplishment as they apply their Chart Skills to reading a book. Every word in the Phonics CODE Books, Read & See and Phonics CLUE Books is carefully selected to match the learner's Chart Skill Level. The entire 100 + books in the Hanson Reading library is instantly available online as a printable book file (print from your computer) or as an eBook. Hanson Reading Phonics Chart System is simple to understand: Master each Chart and apply it. The Charts are important to keep together and review at each practice session. The Charts help learners organize information in their brains for easy retrieval. With Hanson Reading, the teacher can determine a child's reading level by using the Charts as an evaluation tool. If the child knows the information on the Chart at the proficient level that is noted with each Chart and can apply the Chart skills, they are ready for the next Chart. How simple is that! Charts 1-9 take the learner from alphabet letters, consonant digraphs, consonant blends, vowel sounds, and vowel combination sounds to chapter books comfortably with a secure knowledge of how words are constructed and how to decipher unknown words. Hanson Reading students learn HOW to read. This system was created to help all children learn how to read, including children with learning difficulties such as dyslexia, an immature visual memory and attention problems. 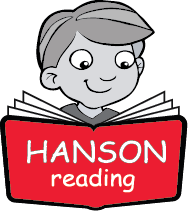 Hanson Reading has been used successfully in schools, private classes and tutoring centers. It is English made logical. Many children fly through all 9 Hanson Reading Phonics Charts, and others take a little longer, but none face frustration and failure as they learn how to read. To reward students with success for their efforts, all materials and books are intentionally designed to focus on one skill at a time. The reading books are fun to read and created so students are rewarded for applying the Chart Skill concepts without the discouragement of meeting words that defy what they have been taught. Many English-Second Language students use Hanson Reading Charts and audio tracks to polish pronunciation skills. Since its creation four decades ago, the system has been tried and tested as a reading system that works for all types of learners. Hanson Reading is composed of what you NEED to know to learn HOW to READ. There isn’t an easier way to learn how to read, it's English made logical.​​ It is a thrill for me to share in your success. ​Reading opens doors, unlocks the imagination, and expands learning. Hanson Reading Phonics Chart System is comprised of everything you need to know to learn to read. ​Hanson Reading requires no prep time. The prompts for teaching how to read​ are right along side each practice skill. ​Hanson Reading Phonics Chart system starts with Alphabet letters and advances through Chart 9 chapter book level reading. Every skill level is quickly evaluated. The teacher and student know exactly where they are on the path to reading success. "It is a tragedy for a child to go on thinking they are dumb. ​ They might not say it, but it shows in their eyes when they can't read."